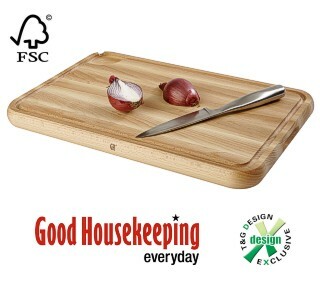 This high quality chopping board is made from FSC oiled beech and has 2 finger grooves, juice groove, well and a pouring lip. It is ideal for cutting bread or carving joints of meat, and the beechwood will give many years of trouble-free service. It is 45 by 30 by 3 cm (17 3/4 by 12 by 1 inches approx). All Good Housekeeping ® wood products are guaranteed for 3 years.